The voice recognition that Google has developed for almost all of its peripherals is a fairly advanced one. It powers Google Now, Google Translate, and a ton more services that we use all of the time. Today, that recognition system is taking on a more educational and human use. 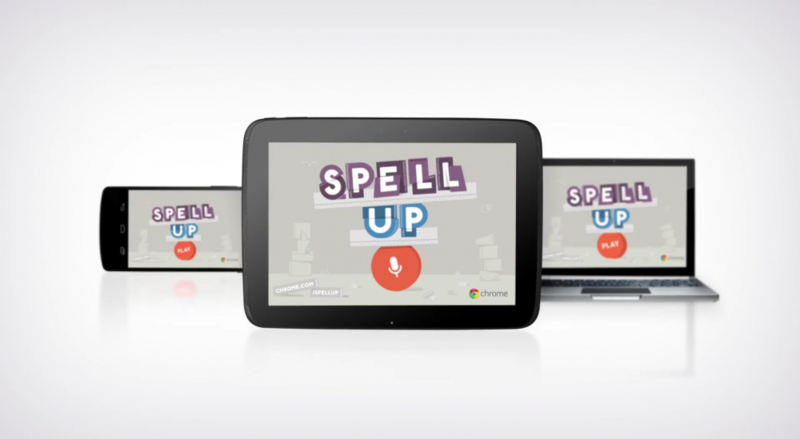 Spell Up is the new spelling and pronunciation game that Google has released, to help everyone get their word enunciations correct. Spell Up is a game that urges you to progress by speaking out loud to your computer. The game asks you to spell words, re-arrange jumbled letters, and fill in the blanks on words. By doing all of these correctly, you slowly build a monolith of words that shows your progress. Google consulted game developers and designers to make the experience more enjoyable, and easy to use to encourage people to educate themselves instead of being frustrated with failing to get something right. The game features achievements, milestones, and other pieces to keep you pushing forward. By building Spell Up off of Google’s Web Speech API, almost everyone with a mobile device or desktop can get in on the fun. Desktops with Chrome, Android phones and tablets, and even Apple devices can play the game (although Apple product users have to type the words instead of speaking them aloud). If you are reminiscing to those younger times when you won your school’s spelling bee, make sure you try it out here.